It was a rainy Saturday. Cold and rainy. After such a bitter winter, a cold rainy day in late April is a bit hard to take. We made it to the farmer’s market this morning, and got some gorgeous spinach and arugula, but after chicken soup for lunch, I thought we all deserved a treat. We’ve been reading Tea Party Rules, and so Gabriel keeps asking for cookies. We used to make these at the cafe years ago, and it was time to taste them again. Today, I made them with freshly ground Frederick wheat from last year’s grain share, and a little bit of freshly ground barley from the year before. Can you see how golden the berries and flour are? If you don’t have freshly ground grains, your cookies will still be yummy, don’t worry, just not quite as spectacular. If you have a toddler on hand to “help” by trying to eat all the butter and sugar, may the baking gods be with you. Baker’s Note: Yes, this recipe is in grams. Don’t be afraid, be happy! This is the easiest and most useful baking tip I can ever give you. Ready? Professionals. Weigh. Everything. If you want to make the same batch more than once, learn to love your scale. If you don’t have a scale, a very reasonable home-sized digital one can be purchased through our Amazon store right here (fulfillment by Amazon, we make a small percentage which helps support us – thank you!). Now let’s make some cookies. I suggest freezing half your dough, so you can make more cookies another rainy day. Preheat oven to 375 F. Weigh out ingredients. Sift together flour, baking soda, and salt, and stir to make sure the salt & baking soda are distributed. With a hand mixer or stand mixer, beat butter until soft and fluffy (about 1 minute). Add sugar, and beat about 30 secs, until very fluffy and smoothly mixed together. With the mixer running on low-med speed, slowly add in the eggs, and mix until combined. Turn off your mixer, and add in all of your flour mixture. Turn on the mixer slowly (or you’ll end up with a face full of flour! ), and mix just until combined – overmixing will make your cookies tough. Add chocolate chips and peanut butter, and mix on low speed just until combined. Drop by the heaping spoonful onto a baking sheet, and press down very lightly so they’re not mounded. Bake 12-15 minutes, until lightly golden all over. 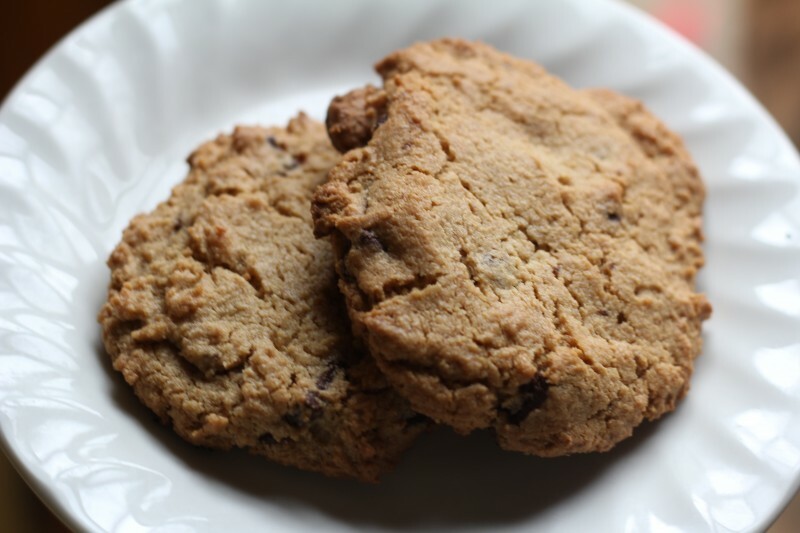 (c) Adrie Lester & Farm Feast CSA – feel free to make and enjoy these cookies, but you can’t publish this recipe your own. Thanks!